TAKE YOUR MEMORIES ALONG FOR THE RIDE! friends and pets while on the go and promote safety while driving. Frame it. Clip it. Go. Visor Frames are thin and durable frames that will clip to any visor. 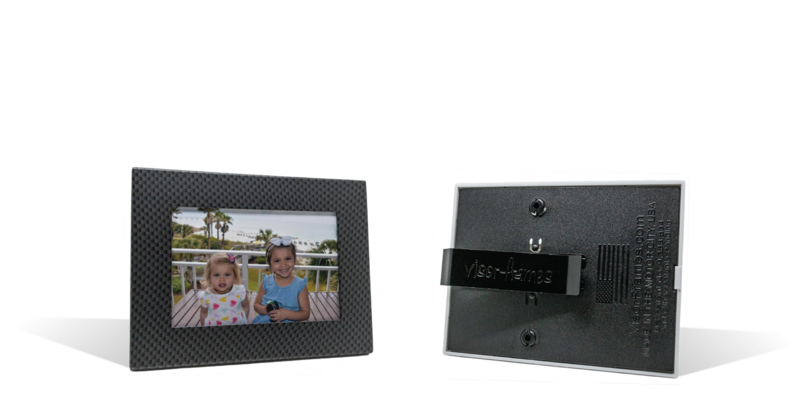 The patented design with 3-position rotating spring steel clip allows the frame to be positioned landscape or portrait. Preserve your memories while you have a reminder of why you drive safe for your life on the go. All intellectual property on the website is owned by Visor Frames, LLC, which includes materials protected by copyright, trademark, or patent laws. All trademarks, service marks and trade names (e.g., the Visor Frames name, design, and tagline) are owned, Visor Frames, LLC. All content on the website, including but not limited to text, software, scripts, code, designs, graphics, photos, sounds, music, videos, applications, interactive features and all other content ("Content") is a collective work under the United States and other copyright laws and is the proprietary property of Visor Frames, LLC; All rights reserved.